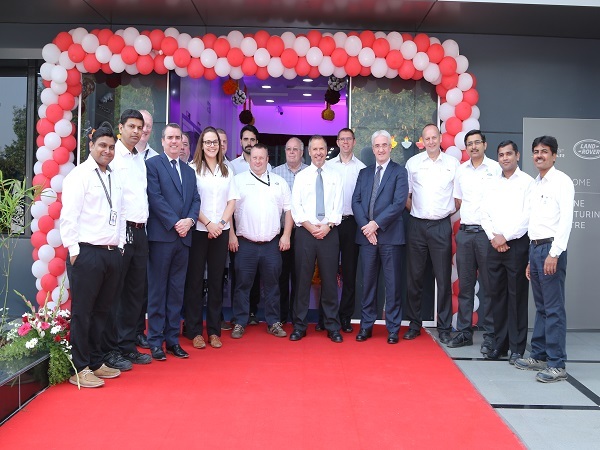 The new Engine Manufacturing Centre in Pune India will manufacture engines for the six vehicles that we currently assemble in the region. The first official Job1 AJ200D engines were delivered to the L Block car manufacturing facility on Tuesday 12th September 2017. The Material Planning & Logistics (MP&L) team have spent many hundreds of hours working with cross functional teams from within JLR & TML to ensure robust processes, IT systems, packing & packaging solutions are in place. The Plant, on the Tata Motors Pimpri site, is a specialised low volume manufacturing centre measuring approx. 2200m2 and comprising a 26 station assembly line which will produce six engine variants. The assembly line and associated MP&L area is designed based on a ‘room in a room’ concept in order to protect the product from any particulate ingress. The project required the design and implementation of an innovative supply chain solution. This uses SAP to order from circa 70 suppliers and supports part by parts shipments from Europe to India. In order to ensure that the components are protected during the Journey to India, a new solution for packing of cranks, blocks and cylinder heads at the Engine Export Facility in Wolverhampton was designed by the International Manufacturing Development Pack team. This design was rigorously tested over a six month period in environmental labs in Hamburg. A unique packing operation was also developed to protect the parts at the Global Packshop at Midpoint, Minworth, using environmentally controlled pods as packing stations prior to onward shipment to India. A Puja (Hindu prayer ritual) was held in the EMC to celebrate the first shipment of engines to the vehicle plant. JLR & TML teams have worked closely overcoming several major challenges to deliver this project in a short span of 1 year from construction of plant to delivering engines to vehicle plant.